The scientists at NASA's Jet Propulsion Laboratory (JPL) cheered yesterday as they received confirmation that the Deep Impact probe successfully hit its target, comet Tempel 1, after six months' and hundreds of millions of miles' worth of journey. The images the mother ship spacecraft sent back are stunning, showing a bright curtain of materials surrounding the impact site, and giving the science team an Independence Day to remember. "The impact was spectacular, much brighter than I expected," said Mike A'Hearn, principal investigator for Deep Impact, speaking in the early morning hours yesterday from JPL via teleconference to a group of fellow colleagues and friends at his home institution, the University of Maryland. After the successful 1:52 a.m. EDT impact on July 4, A'Hearn said that it will take days to years for the scientists to wade through all the images and data. "There's a lot of image processing to be done," he said. The mission's aim was to ram a spacecraft into a comet to dig up the volatile materials buried below the body's surface. The materials ejected in the impact, researchers hope, will shed light on the origins of the solar system, as the volatile ices and gases are believed to be some of the oldest and coldest materials left over from when the sun and planets formed 4.5 billion years ago. When NASA's Deep Impact probe collided with Tempel 1, a bright, small flash was created, which rapidly expanded above the surface of the comet. This flash lasted for more than a second. Its overall brightness is close to that predicted by several models. This image was taken by Deep Impact's medium-resolution camera. All images courtesy of NASA/JPL-Caltech/UMD. Deep Impact achieved its goals, by re-creating a naturally occurring event, common throughout the solar system. As Derek Richardson, astronomy professor at the University of Maryland, explained to eager Deep Impact partygoers yesterday, Earth has experienced many significant impacts of asteroids and comets, including the infamous one, 65 million years ago, that scientists think spelled the dinosaurs' demise. Deep Impact, he said, is going to bring some karma to the solar system. "Tonight, hopefully we got our revenge," he said. It's the "Earth strikes back." And it did. At 2 a.m. EDT on July 3, almost a full day before impact, the washing machine-sized Deep Impact probe separated from its mother ship, and began its own journey to the nucleus of Tempel 1, about 14 by 4 by 4 kilometers in dimensions. From a distance, all the probe could see of the comet was its coma  the cloud of gas that surrounds the comet. But as the probe got closer, it began to discern the heart of the comet  its nucleus  and sent back pictures in real-time of what appeared to be a pear-like structure. 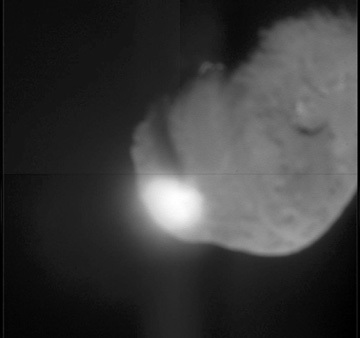 This image shows the view from Deep Impact's probe 90 seconds before it vaporized after impact with comet Tempel 1. 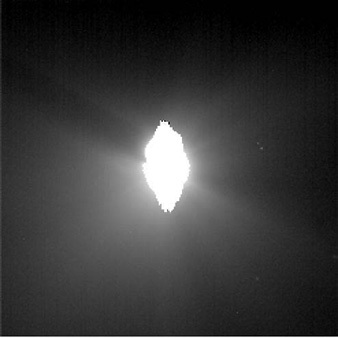 The image was taken by the probe's impactor targeting sensor. "The resolution [on the photos] is really quite extraordinary," said Don Yeomans, co-investigator for Deep Impact, also at JPL for the event. The pictures show a comet that has perhaps experienced impacts before, with crater-like structures on the surface. "There's a lot of structure on the comet, which is a bit surprising," Richardson said. "That could mean there's some strength to the comet." As the probe neared its target, it began to experience comet conditions, with gases and debris bombarding it. "Our brave little spacecraft is now in a very hostile environment," Yeomans said, as the probe's pictures were sent back to Earth. The impactor spacecraft, however, survived much longer than expected, delivering images right up until its demise. "The last image we got was three seconds before impact," A'Hearn said. The mother ship fared well too, sending back the first images of the impact itself, a cosmic explosion of sorts. After the initial flash from impact, a bright plume quickly extended above the comet's surface. The debris from the impact eventually cast a long shadow across the surface, indicating a narrow plume, rather than a wide cone. A preliminary analysis of the data indicate that the upper surface of the comet may be fluffy, or highly porous. Based on lab experiments with highly porous targets, rich in volatile substances, the crater is likely to be large. In the end, the scientists hope that analyzing the crater left behind by the impact will tell them more about what holds these mysterious bodies together. While the Deep Impact team analyzes the images from the mother ship, it will have help from the many scientists who were watching the impact from telescopes around the world. Immediately after impact, observers on the ground had already seen an increase in the comet's total brightness. The view from Deep Impact's probe 30 minutes before it hit comet Tempel 1 highlights the comet's coma, the cloud of gases and dust that surrounds all comets. The picture's brightness has been enhanced to show the jets of dust streaming away from the comet. Only as the probe got nearer could it see the comet's nucleus. 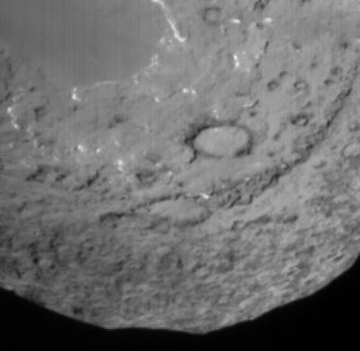 The image was taken by the probe's impact targeting sensor. As to whether the impact would affect the comet and its path through the solar system, Lee Mundy, head of astronomy at the University of Maryland, said "it's like a mosquito hitting a 747." Although the outgassing from the impact could cause a small shift in orbit, it is unlikely, and so far, it looks like the comet is doing just fine. For more background information on Deep Impact, read this month's feature story. Order your free trial copy of Geotimes!